Travelers/vacationers all around the world, their first step forward on planning their tour/vacation will be to look up for an online rental booking website. Online rental booking websites are not only providing its users about the best rental space to accommodate on their preferred destination, it also provides idea about the other rental services available on that destination. So it is assisting as a virtual guide for the guests, to avail the best rental spaces for accommodation and also providing option to book other rental services around that destination. This online business can garner a huge revenue when it is done on a right platform. And the one best platform for online rental booking business is the Appkodes’s accommodation script. Online rental booking website and apps is not only boon for guests (travelers/vacationers), it is advantageous for the hosts (rental owners) too. So every readily available script for online rentals business on market should possess an equitable platform to best connect the guests and hosts. By default, Appkodes’s script for online rental booking business has many good features on its eye catching UI, to setup a best platform. Appkodes Airfinch Script for online rentalbusiness is designed in such way to benefit all involved on it, right from bottom to the top. Instant/request booking - This feature enables guests either directly to book rentals without concern of host or book rental by requesting to the admin. Social login/Message- Guests can easy sign up and login using their ever reliable online (social media) account and for enquiries guests can directly message to the hosts through the message window. Map and Location based search- Appkodes’s script is integrated with a map feature and guests can make use of it, to search for rentals as they move on the map or selecting a specific location. Advanced search/filter- This feature enables guests to look out for rentals on their preferred type, specific price range and amenities, etc. Multiple currency/ currency converter- Appkodes’s script has multiple currencies on it to provide an opportunity for business in multiple countries. Admin can decide the default currency for listing and guests from different countries can make use of currency convert to convert the value for their currency. These are some of many good features defaultly present on the Appkodes’s accommodation script for online rental booking business. Still there are many fascinating features are present on its UI. Commission Set up- Admin can earn from fixed or percentage wise commission from the specific hosts for every bookings made on your website. Property Listing fee- You have built a creative for online rental bookings, so you can charge a specific amount from every hosts to list their spaces on your platform. 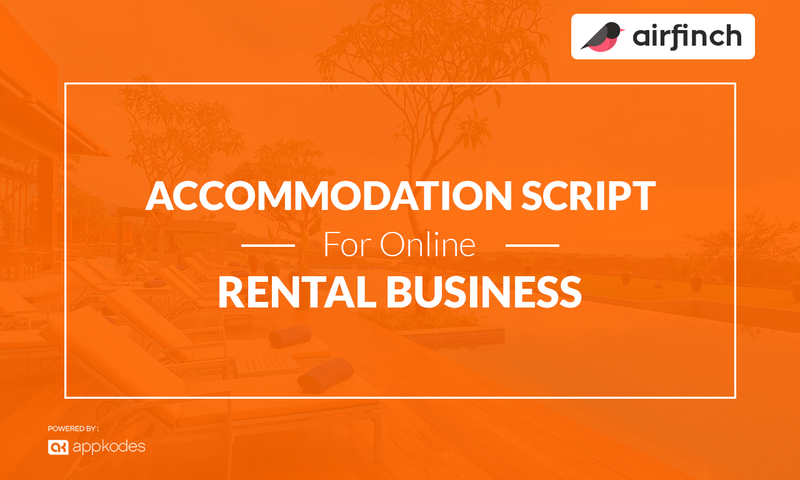 Earn prolifically just by owning an accommodation rental script- Appkodes Airfinch. Appkodes script for rental bookings is readily available with web, native ios and android app. Also it can be easily customized for any online rental booking business, you prefer. So avail this best script on market, to see your ideas for business live!. Pre-booking a rental space for accommodation or a rental service will let vacationers/ travelers to effectively use their time of vacation. So the frequent travelers are preferring the best rental booking apps to list a space for rent or to avail to space for rent. Which means users can be either a rental seeker or a rental owner. So this app is helping its users to make money and also on finding best rental spaces or services on their preferred destination. With the increase in the number of travelers exponentially it is wise to start an online rental booking business, which has guaranteed revenue generation model. Building your creative and user attractive rental booking app is easy with Appkodes readily available rental script. How Rental Property Website Builder Can Help Your Rental Business Idea? Peoples are exploring some way or another to earn money. One among that is leaving their home/apartment for rent to make money in their time of vacation. So through which these peoples will let know others that they are leaving their space for rent?. And when the same peoples leave to another city for vacation and if they are seeking a rental house to be like staying in their own home, from where they can easily know about the availability?. One solution can solve these two queries that are the best rental booking website. You may be well aware of all these. So we shall straightly dive into how a rental property website builder- Airfinch can help your ideas of setting up rental booking business? Availing a readymade script has got many advantages one among that is, it will have the tested business model. To state clearly, it will have the model of any one prevailing successful brand in the industry. So it reduces the risk of failing in your business.